This moves shows an absolute control and beautiful trick in its own right, it is also the final building block to a couple of world class air pass moves. Once nailed you will be the envy of many at your local point, and it will spur you on with a new found confidence to try more technical tricks that not so long ago seemed impossible to reach. First, your unhooked popped back loops need to be 100% accurate and controlled. By this we mean that you need to be executing a popped rotation at a slow pace. This will result in your land facing downwind. Such a back loop will also result with your landing with slack lines with no pull from the kite and a feeling that you’re actually dropping down. To achieve this, the three things to remember are the head position, kite and the point of sail. Try not to use your head for rotation, just look forward where you are going to take-off and leave your head square with your shoulders. In picture A, the surfer is coming around his rotation but isn’t looking over his shoulder. This way you’ll not suddenly be round and landed, but will have that split second to think about throwing it to blind. You need to have the kite a tad lower than your usual measure. If it is 11 or 1, you will be less likely to spin under the kite and there will be something to pull against to get your knees up and the rotation to blind starts as in picture B. You can see the surfer is really pulling his knees in before throwing to blind. Where you take-off is where you land. So if you want to land more downwind, you need to take-off more downwind. The real advantage of this is that if you start your back rotation in the air, sometime before the board passes through the wind; your brain has time to react and ponder the blind a bit. If you take-off into the wind, you will be able turn around before you have time to pull. So once again before attempting a back to blind, hammer out back loops to get the first part automatic! The blind in the Back loop to blind is made more difficult than a front to blind because it is by the fact that not only you are throwing to blind, but you actually have to break your rotation and turn the other way. In the raley, your body is trying to twist the wrong way so it should have trained you in a certain level. As mentioned already, your head, kite and point of sail will be crucial here. By not looking for your landing over your shoulder, you’ll find it easier to change the direction that your body is travelling in. With the kite lower, your feet will be higher and your body will be in a horizontal position sp you can pull against the bar to stop the initial back rotation and go the other way around. And having taken off earlier, you can rotate more slowly which in turn means that there will be less momentum to fight against. 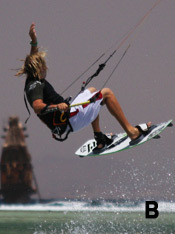 Do not forget to turn your head and twist your wrist, pointing your thumb at where you are going as in picture C. This will help your shoulders turn further, enabling you to turn the board further and stick a more downwind landing with the bar in the right place (picture D) to grab when you go for the surface pass. 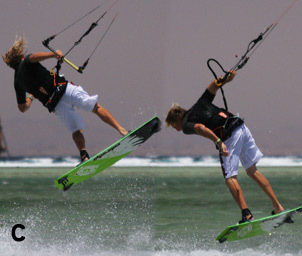 Once you have mastered a load of back loops, do the same with several raleys to blind and then you will be ready! Following the sequence which is relatively low and in very light wind will give a good way of confidence. Do not forget to make sure your leash is on the correct side. pic 1 – The surfer come up over the board flat off and unhooked knowing that the coast is clear. His kite is around 1 o’clock and his hands are together in the middle of the bar. pic 2 – From a broad reach the surfer carves hard against the power in the kite, front leg extended and back leg flexed and ready. pic 3-4 – As the board turns upwind, the surfer extend his back leg and pops up. The surfer also keeps his arms bent as this will make the pull in for the twist to blind much easier. 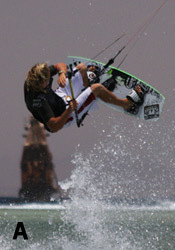 pic 5 – Due to the pop and the kite position, the surfer is pulled into a more horizontal back loop. pic 6 – As the surfer comes around the back loop, the board is behind and up in the air, almost where it would be during a raley. This is the moment to throw the blind and later on you will miss the chance as the board will start to drop. pic 7 – The surfer pulls the bar hard towards his front hip to initiate the twist to blind. If the kite were much higher, this would be harder as it would not turn. At the same time the surfer turns his head in the opposite direction and keeps his knees up. pic 8 – To make sure, the surfer turns far enough and looks around towards the direction of travel. pic 9 – The surfer will then be able to turn his thumb down and forwards, twisting the bar which moves the shoulders further around, therefore allowing the surfer to get his upper body low. pic 10 – So now an arc has been created, the surfer can easily pass the bar behind the small arc of his back. pic 11 – And finally, the surfer turns to face the new direction of travel and sort it out. This entry was posted on April 8, 2012. It was filed under Intermediate and was tagged with back loop, Back Loop to Blind, blind.